Sherrie Gruder is making her house "greener". Gruder, a resource conservation and recycling specialist for UW Extension, is renovating her Shorewood Hills home to increase energy efficiency and improve indoor air quality, two key elements of greener; more sustainable homes. "You don't have to build new to lower your impact on the environment," she says. "You can make green choices in any house project to improve indoor air quality, increase water and energy efficiency and save resources." So far; Gruder has replaced a rotting roof and installed roof venting to eliminate moisture and mold problems. She also improved indoor air quality by using nontoxic materials that don't off-gas. She built a new railing around the roof using recycled plastic lumber and installed insulation made of recycled blue jeans. She also added a supplemental heat source by replacing a drafty gas fireplace with an energy-efficient sealed combustion unit that won't leak carbon monoxide into the house. Green building--the use of resource-efficient strategies and materials--is catching on in the Madison area, long a leader when it comes to recycling, reducing and reusing. But it's a slow process. "Moving toward green design and construction requires us to examine our values and how they're affecting the choices we made at every level, "says Lou Host-Jablonski, an architect at Design Coalition in Madison. "We actually have to 'green' the entire building infrastructure." This fall, Design Coalition, a nonprofit architectural and planning office specializing in green design and building, sponsored a hands-on workshop on natural, affordable hombuilding. Host-Jablonski showed participants how to use natural and low-toxicity materials, including straw-clay wall construction and earth plastering, as well as solar water heating and native landscaping. But while green materials and design strategies are now easier to come by, says Matthew Tendler, director of Sustainable Design Services at Kahler-Salter Architects in Milwaukee, "many people still make choices with little to no regard for their impacts." And this presents a huge challenge for green-building advocates. As Host-Jablonski says, "If green design and construction of houses is anything, it's relooking at the values and choices we make at every level. It's about raising people's expectations, making the picture a bigger picture, so you're essentially changing values and realizing that good design is more than how the house looks. Because although beauty is important, part of beauty is green wisdom, a house that's healthy for the people in it and healthy for the planet. A recent survey by the National Association of Home Builders found that consumers are overwhelmingly willing to pay more to build green. In fact, builders rated consumers' willingness to pay for green options much lower than it actually was, indicating that in some respects, consumers are ahead of builders. Sam Breidenbach, a builder for TDS Custom Construction in Madison, says incorporating green practices requires more awareness on the part of builders. His company works with clients who want to use green ideas, but lets them know what this entails. "Clients who really want to build with this philosophy have to be willing to sacrifice or compromise on the schedule as well as cost and cost is usually the big thing." Tendler, however, says a greener home isn't necessarily a more expensive one: "There are some products that might individually cost more, but if good design practice and planning have been used, the costs are often comparable." He adds that many times claims of higher costs simply reflect priorities. "On a broad level, Americans have enough money to build green,"he says. "But I think it's a defense mechanism that makes people say green things cost more--people don't want to admit they don't value it." While cost differences are real, Host-Jablonski urges people to be conscious consumers by remembering that many costs in conventional materials and products are "hidden" because they're subsidized in the marketplace. "When we have 1,500 petroleum additives in our paint, we don't see a certain proportion of the true cost because it's in the cost of the military to guard the ships that bring the oil from the Middle East. And it's in subsidies for roads." Paints and other greener alternatives are typically plant based, locally produced and renewable, says Host-Jablonski so "you get a truer sense of the cost because they're not subsidized in the marketplace. The cost is a little higher, but only because it's really what they cost." Green building also requires consumers to think in terms of long-term costs. A more efficient heating system might cost more up front, but will save money in the long run due to lower energy bills and reduced maintenance. Advocates of green building also urge a broader definition of "cost," including costs to personal health and the environment. "You can sell paint that will stick to the wall. "says Host-Jablonski. "It's carcinogenic. but you can sell it more cheaply. You're capitalizing the benefits, getting money from the benefits of the paint you created. But you're socializing the true cost -- you're extending out onto society the toxins and health problems. Advocates of green building warn consumers to beware of "green washing," the trend toward billing products as environmentally friendlier without actually making them so. "Now you've got all kinds of major paint companies claiming their paints are healthy without toxins," says Host-Jablonski. "But they're not. They're a little less toxic than before, but they still include all kinds of toxic compounds." This points to the need for education at all levels. Gruder says homeowners must lead the charge. But she says some builders and contractors are actively seeking real-world experience. "Contractors have been doing things the same way for a long time.," she says, "so they know how to estimate a project. When they're asked to do something different or use a new material, they might think it will take longer, they're not sure how much material they're going to need, they're not sure how much waste it's going to cause, etc." 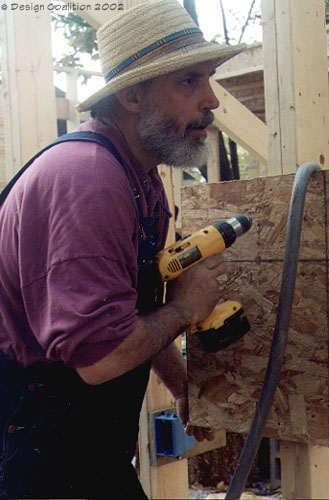 When Gruder chose cement-fiber siding rather than cedar, vinyl or aluminum, which have negative environmental impacts in their extraction and manufacture, one builder told her it would cost twice as much: "They were unfamiliar with it, so they didn't want to lose money on labor:"
Host-Jablonski explains that builders are in a difficult position because they make money, meet timelines, and meet people's expectations by adhering to what they know how to do. "This is a new thing to builders. And to bankers. And to real estate people. It takes people a while to get acclimated to this.